The minimalist look has long prevailed in the Nordic interior style, and now it's time to mix it up. To be brave. To blend color, styles and patterns, in new sparkling and vibrant expressions. Brass, dark gray velour and black and white palm print as cool contrast provide the perfect interaction between raw and romantic. - As a creative director in the furniture business, I think in shape, color and comfort - and most often focus is on what's at least a touch of mainstream. It must of course be good (and really nice) design, but there must also be something many people can envision in their homes. That's why it's super cool sometimes to get the chance to play it up a little. And that's exactly what we do with our Collectors Edition collection. - Here, we give the designer freedom and see what the result will be. And when Malene Lillelund showed me the drawings, I knew that the couch should be the summer's Collectors Edition in 2017. It 's a play on the mix between aesthetic and characteristic. 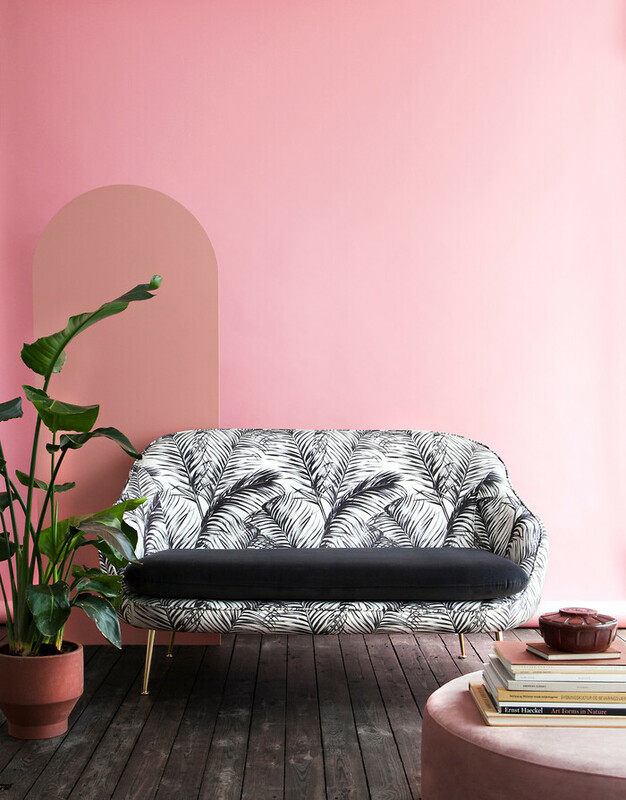 The result became this beautiful statement sofa, says Sofakompagniets creative director, Cathrine Rudolph. Fenja is the latest Collectors Edition sofa from Sofakompagniet. The shell has soft shapes and slim, angled metal legs in a brass look. It is covered with a black and white palm print, and the large seat cushion is in dark gray velor. The sofa's design is inspired by iconic retro furniture, combined with today's sleek design lines. The sofa is a timeless classic with a feminine and exclusive expression and designed by Malene Lillelund. Fenja is the fourth piece of furniture in Sofakompagniet's concept Collectors Edition. Fenja is produced in 60 copies, and where the concept has previously been tested exclusively on the Danish market, this time the sofa will also be available in Sweden, Norway, Germany, Holland, Switzerland, Belgium and Poland.